I have known author Samantha Clark for a number of years now. Our paths cross regularly in a number of ways: We are both members of Society of Children’s Book Writers and Illustrators (Sam is the Regional Advisor for the Austin chapter); We both attend many of the same writer’s conferences and retreats. 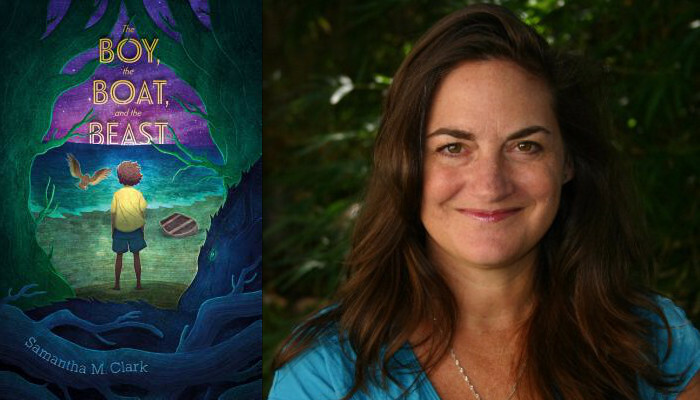 I’ve watched with eager anticipation her journey to publication with a fabulous and thrilling middle grade novel called The Boy, the Boat, and the Beast, which debuts at the end of this month. Thus I was delighted when Samantha agreed to take time to chat with me about her new book, the craft of writing, her road to publication, and more. Here’s what she had to say. JOY: So I don’t want you to give away too much since there are definitely some huge surprises in The Boy, the Boat, and the Beast, but I’d love to chat a little about the inspirations for this novel about a boy who washes up on a mysterious, seemingly uninhabited beach and doesn’t know who he is. That last part particularly is so fascinating to me. What can you tell us? SAMANTHA: All of my stories start from a very small idea, and The Boy, the Boat, and the Beast was no exception. But funnily enough, that very small idea came to me when we were living in Houston. ☺ My husband was working for a NASA contractor and we were living in South Shore Harbor. We loved that area, and one of my favorite parts was walking our dog to the park and marina on Clear Lake. It was during one of these walks that I began to wonder what would happen if a boy woke up alone on a beach and had no memory of who he was or how he had gotten there. The boy was so clear in my head, and I thought about him all the way back to our house. When I got home, I had a novel forming. I told my husband, and we sat brainstorming ideas for over an hour. But, while most of the ideas we talked about that Saturday are still in the book, the real story—why the boy was there and what his true journey was—wasn’t clear to me until I wrote the final scene of the first draft. I remember having this huge ah ha moment, when I thought, “That’s what this book is about.” Then story came through as I revised over and over again with this in mind. JP: What a fascinating kernel of an idea. I’m always a fan of stories where the mystery unfolds for the reader at the same time as it is unfolding for the protagonist. And speaking of fascinating things, the book’s cover is just so amazing. I know you agree, so can you address why it’s so perfect at capturing the book? SC: Yes, I couldn’t be happier about the cover for The Boy, the Boat, and the Beast, and I owe everything to Laurent Linn, art director at Simon & Schuster, for the design and Justin Hernandez for his beautiful illustration. When I first saw it, I was actually sitting on a beach. I was visiting my parents in the Cayman Islands and working on my next novel by the ocean. I took a break to check my email and gasped when the image opened on my computer. It was perfect. Laurent and Justin showcased key elements of the book, including the boy, the boat, the owl, the Green Wall of trees and the ocean. But they also brought out the otherworldly element of the story in the saturated colors, the way the horizon is a little askew, and the tree trunks curving across the bottom. My husband, a visual effects designer, created an animated version of the cover, which I can stare at for hours. It’s on my home page at www.samanthamclark.com. JP: The Boy, the Boat, and the Beast is also your debut novel, which is, of course, very exciting! Tell us a little about that journey to publication. How did that happen for you? SC: Yes! The Boy, the Boat, and the Beast is my debut novel, but it isn’t the first novel I wrote; it was my third (not counting the novel I started but didn’t finish when I was in college). By the time I signed with my agent, I had written two more novels. So you could say my journey to publication was pretty long. I began writing The Boy, the Boat, and the Beast in 2010, and it went through multiple editions—and many rejections—before it found a champion in my agent, Rachel Orr with Prospect Agency. After doing more revisions, we sent it out on submission to the first round of editors in October 2015, and while it got some close calls, it mostly got rejections. But I felt like I could still go deeper with the story. I had learned more while writing the other novels and knew I could take the middle-grade novel further. An editor gave me a revise and resubmit with wonderful notes. I took her notes plus the ideas I had and did a big revision that pushed even more into the story and its magical elements. That publishing house still ended up passing on the manuscript in late 2016, but when Rachel sent it to another round of editors in early January 2017, it got two offers in three weeks. I was speechless, to say the least. ☺ It’s still surreal to think that my book is coming out from Simon & Schuster, but it’s the most wonderful dream come true. JP: I think everyone who writes always preaches about that need for perseverance, for understanding that publication for the long haul is a marathon, not a sprint. And in a related question, why middle grade? What attracts you to writing for that age group? SC: It’s funny, I love reading middle grade books, but when I was in college and started writing my first novel, it was for adults. I never thought that I could write books for kids. For some reason, I thought that if you wrote novels, you had to write for adults, which is so not true. It wasn’t until I started reading children’s books again as an adult that I remembered why I loved those stories so much. By then, I had been dabbling in screenplays (I was living in L.A. at the time and figured, when in Rome… ☺ ), and my protagonists were all kids or teens. So when I moved back to writing novels, I kept the same type of stories. I’m not sure, though, that I can pinpoint one specific thing about middle-grade or young adult, which I also write, that makes me want to write for that age group. Perhaps it’s the innocence of middle-grade, or the possibility—this is the age when we’re just starting to figure out what kind of person we want to be, and there’s so much excitement and opportunity in that. Or perhaps it’s that kids and teens seem so much more willing to stretch their imaginations. Mostly, though, these are the stories that are within me, probably because they’re the ones I loved most when I was a kid, and they’re where I want to stay. JP: Good answer! And speaking of stories, what’s on your nightstand right now? What books, besides your own, are you obsessed with? SC: Oooh, this is a good question. I love all types of books, but I’ve got a particularly soft spot for fantastical stories. Some of my favorites are The Book Thief, the Chronicles of Narnia, and anything by Neal Schusterman. This year, I’ve also been reading a lot of books by other debut authors. So many wonderful books have come out from brand new voices this year. One of my favorites is Peasprout Chen: Future Legend of Skate and Sword by Henry Lien, and some I can’t wait to read are The Hotel Between by Sean Easley, The Land of Yesterday by K.A. Reynolds, The Turnaway Girls by Hayley Chewins, and The Prophet Calls by Melanie Sumrow. On my nightstand now is actually a YA, The Wicked Deep by Shea Ernshaw. JP: Some great recommendations there! I also love the cover of Peasprout Chen, by the way! It’s so vibrant! Anything else you want us to know about Samantha Clark? SC: You probably can’t tell by the way I’ve typed this, but I have a funny accent. ;) I grew up in five different countries and my accent is a bit muddled now. It’s a little American, a little West Indian, and a lot British. And because it’s so mixed, I usually manage to confuse people when we first speak. Living in America, I hear, “You’re not from around here, are you?” a lot about halfway through a conversation. And yep, I’m not, but the world is really quite a small place, and I’ve found that no matter where I go, humans deep down are the same and want the same things—just with different accents. JP: Agreed. Thanks so much, Samantha! We are all so excited for The Boy, the Boat, and the Beast, which will be in the store on June 26th!